Just like in real-life, arguments on the LSAT are not always air-tight. Ideally, there should be no huge gaps between your premises and conclusion. But, sometimes, there are! Perhaps to prepare you for a career as an attorney, the test-writers include necessary assumption questions on the logical reasoning section to test your ability to recognize these gaps. If you’ve been struggling with them, take a look at these tips for necessary assumption questions. Necessary assumption questions will present a short argument with a confident conclusion. However, there will be a premise that they haven’t included. If this unstated premise happens to not be applicable to their argument, their conclusion wouldn’t be justified. Ultimately, the argument needs that unstated assumption, or it would fall apart. That’s why it’s necessary! Premise: Julie loves her salsa dancing class on Thursdays, and she always goes if she can. Premise: Julie agreed to her boss’ request to work late–until 9pm, this Thursday. Conclusion: Julie won’t be able to make it to her Thursday salsa class. So can we be 100% sure that Julie can’t make it? What’s missing here? Think for a moment and imagine all the information you could add that would make the conclusion less certain. The salsa class is at 6am-8am, and Julie works starting at 9am. Julie attends the class on her lunch break. Julie’s boss will allow her to leave for the class and return to work until 9pm. Julie’s teacher is privately booked and will schedule the class whenever she wants on Thursdays. You see how, if you add any of these premises, the conclusion falls apart? As you can see from the above example, it’s important to keep an open mind about these question choices. You don’t have to predict a necessary assumption perfectly, because there are so many possible ones. What you should do, though, is recognize the argument’s gap. If you didn’t instantly recognize this as a necessary assumption, you should try negating it. It would become “The salsa class is NOT held during a time that conflicts with Julie’s work schedule.” With the assumption negated, you’d be more sure that the conclusion is attacked. Knowing logical opposites is crucial for being able to negate assumptions. These include opposites like is/isn’t, sometimes/never, always/not always, and more! Memorize and practice using these opposites all the time. 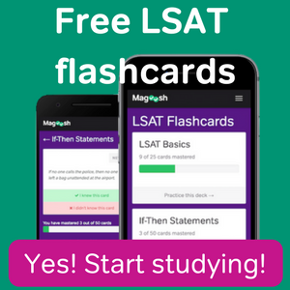 You can practice them with Magoosh LSAT flashcards! 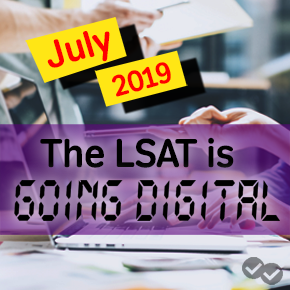 Finally, unlike tests like the SAT, there aren’t too many consistent tricks that you can find on the LSAT. But, there is a common trick you can find in questions like necessary assumptions. The test-writers might include an answer choice that fulfills another purpose. For example, they might include an answer that strengthens the argument, or even a sufficient assumption. If you lose focus for a moment or forget your mission, you might quickly choose this answer choice! So keep your mission clear–find the unstated assumption that the argument needs to hold up. With these tips for necessary assumption questions, you’ll be better able to conquer logical reasoning!